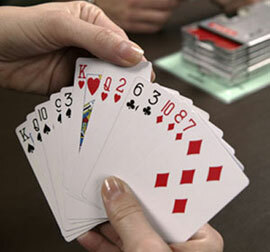 The game of bridge is a stimulating social and competitive sport. Yes, I feel this is a sport. It takes a great deal of mental stimulation and thought processes, all the while combining the social interaction and fun that one gets out of the game on the way! All ages enjoy this sport from our competitive juniors to our seniors. As baby boomers retire, bridge is a great activity to take up as a hobby. Having taught bridge to beginners, intermediate and advanced players I have seen steady progress in the players to advance their knowledge in this challenging activity. In addition to group lessons, I have played bridge professionally with partners. With the advent of the use of dealing machines in duplicate, my students have gained great insight into the many types of competitive hands that they get at the table and have learned that bidding, play of the hand and defense all must be combined to achieve success. Bridge lessons involve the use of a handout, board instruction and teacher student interaction to deduce the answers to the various challenges whether in bidding , play or defense. We combine this with actual hands that have been constructed in DealMaster Pro with an emphasis on the concepts discussed in the bridge lesson. After several lessons, hands are introduced for a variety of concepts having been introduced thus far in the series being taught. On this Website you will find the bridge classes I am offering in Northern Virginia. Some are private instruction at country clubs or with group instruction and some at community centers in the area. You will also the find the many duplicate bridge games that I direct in the area as well as a column I will be writing to address conceptual challenges in bridge based on games I have played at in the area. I look forward to assisting you in learning the game of bridge and help you achieve mastery of the many concepts in this fascinating sport!